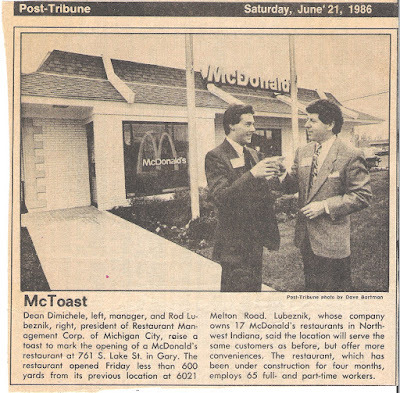 The McDonald's I worked at when I was 20! This month I am celebrating the 30th anniversary of my first job, paperboy for the Gary, Indiana Post-Tribune, and the 25th anniversary of my 2nd job at McDonald's (see photo for June 21, 1986 date). On my paper route, I was rewarded for speed, efficiency, attention to detail, and client relations because by being an all-around swell guy, I could get new subscribers, keep existing ones, and earn bigger tips. Later, during my 9 month tenure in fast food, I would be assigned various cleaning and maintenace tasks. Using what I learned as a paperboy, I would finish my tasks, then get sent home early. Lost time at $3.15 per hour really added up! So I discovered job expansion, making sure the jobs took the allotted time and no less. Actually, today, as a CPA, I focus more on details than speed, but that's not because I'm worried about getting sent home early. Job security would be an issue if that happened more than once in a great while, especially during tax season. On the details thing, I've found that clients like their financial statements, accountants reports, and tax returns more accurate than not. If a client were to get an IRS notice because of inaccurate work done, I call it "a bad thing." Just like my customers 25 years ago in the drive through thru lane, who liked their orders more accurate than not. Too bad my shift managers were too hung up on the drive through thru wait times. "Where are my fries?" they ask. "Sorry about that, sir." The biggest lesson I learned in fast food is that in that industry, people work hard, inconvenient hours, for little pay. Therefore, I respect them, and I make sure I decline politiely when asked "will that be a large fry?" After all, they are required to suggestive sell. I would do that today still if given a chance. Someday I'd like to ask a client "will that be the long form?" when asked to to their taxes.